Award-winning UF education technology researcher Albert Ritzhaupt received the Valencia College Distinguished Alumni Award for his contributions to the ed. tech field. Ritzhaupt, who received his associate’s degree from Valencia in 2001, is an associate professor and coordinator of the College of Education’s ed. tech program. He said the award motivates him to continually set high goals. Ritzhaupt has his Ph.D. in curriculum and instruction with a specialization in instructional technology, and an MBA degree focusing on computer and information sciences. 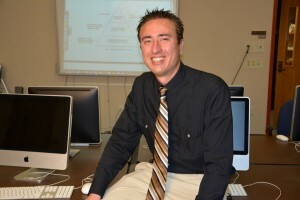 He was nominated for the award by his former professor and mentor Colin Archibald, who teaches computer science at Valencia. He said Ritzhaupt’s unusual combination of graduate degrees gives him an advantage in his field. A large portion of Ritzhaupt’s research encompasses the design and development of technology-enhanced learning environments. His research has reported in more than 80 publications and conference proceedings. He is the editor of the Florida Journal of Educational Research and associate editor of the Journal of Educational Computing Research. Ritzhaupt has won best research paper awards from several national and international professional organizations. Funding sources for his studies include the National Institutes of Health, National Science Foundation and the Florida Department of Education. Ritzhaupt has also played an important role in advancing the COE’s online master’s degree program in education technology. Last year, the program went from being unranked to ninth in the nation by TheBestSchools.org, a higher education website for college information seekers. The excellence of the ed. tech online program played a role in advancing the COE’s overall online master’s degree program to the No. 1 spot in the 2016 rankings of America’s Best Online Programs in Graduate Education by U.S. News and World Report magazine this year.